When I think about all the elements bound together in the issue of prison education, I think about a continuum that starts with a person’s early schooling and continues through to the policing of their community, arrest and sentencing, intake, time served in prison, the period before release from prison, the moment of release and then the time following release. If we’re going to change the way that system operates, we need people who are equipped to respond to every phase: We need educators, law enforcement, advocates, community justice organizations and public safety officials to come together. Earlier this month, my colleagues and I were amazed and gratified to see representatives from all points on that continuum in one room. The Ford Foundation gathered leaders in education and criminal justice reform in California for four days of discussions and presentations about how to advance high quality prison education programs and reentry services—to dramatically reduce recidivism by giving inmates the tools they need to transform their lives and contribute to the wellbeing of their communities upon release. California State Attorney General Kamala Harris gave a powerful keynote address in which she advocated for policies that are “smart on crime,” including a recidivism reduction pilot project supported by Ford. On that same day, virtually at the same time across the country, New Jersey Governor Chris Christie held a press conference to discuss his support for a Ford-funded effort in his state: the expansion of the New Jersey Scholarship and Transformative Education in Prisons program, part of a correctional education and reentry initiative with the Vera Institute, which also includes the states of Michigan and North Carolina. It was thrilling to know that two prominent state officials—one a West Coast Democrat, one an East Coast Republican—were touting their support for this work simultaneously. On Saturday, we gathered at Ironwood Prison for a TEDx event—the first ever to be held inside a California prison—focused on how educational opportunity can counter mass incarceration. The atmosphere was, in a word: electric. In the prison gymnasium, before an audience largely comprised of students in Ironwood’s education program, we listened as student inmates told their stories of transformation through education. These are not just prisoners but students and scholars, people working hard to change their lives so they are equipped to be thoughtful, constructive, participative members of their communities. We also heard from committed advocates including Sir Richard Branson and Scott Budnick (the founder of the Anti-Recidivism Coalition, without whom this event wouldn’t have been possible), former prisoner and current California State Assembly candidate Prophet Walker, motivational speaker Sean Stephenson and Ellen Rutledge, whose son was murdered in 2008 and now works at Ironwood State Prison. She spoke powerfully about forgiveness. I was honored to have the chance to speak about my personal experience with the uncomfortable truth that some kids are set up to succeed while others are all but set up to fail—and what kind of policy and systems changes are needed to change this. 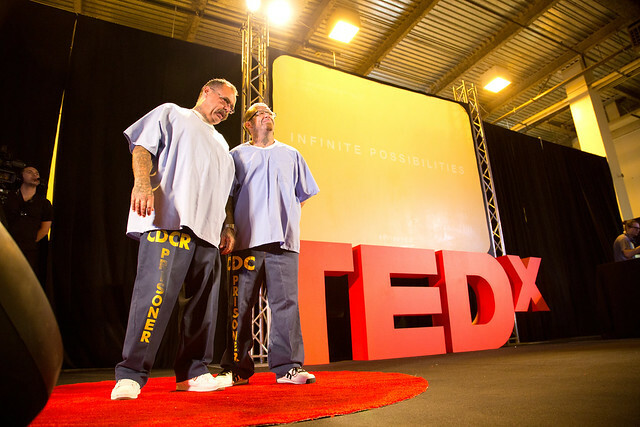 Watch more videos from TEDx at Ironwood State Prison. The bottom line is that we can no longer afford to assume that prisons are disconnected from communities. In fact they are inextricably connected: Mass incarceration has huge implications for education, health and the economy of the communities impacted by it, most of which are underserved and marginalized. That’s why, when I talk about criminal justice reform, prison education and reentry services, I frame it around the bigger picture of rehabilitating and renewing whole communities. These connections matter deeply.